I freakin' love polenta! 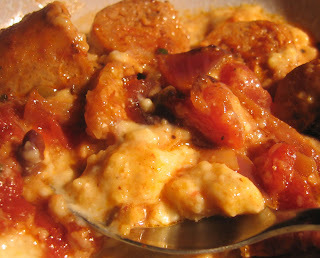 I know I've mentioned this before and in fact posted a blog some time ago with nearly the same recipe- Polenta and sausage. But I didn't have any photos of that meal - so thought it was worth revisiting. Polenta is versatile and can be so tasty; and in this current economy - it's easy on the wallet! Serve it soft and creamy or let it form into a base you can top for little appetizer or even use as bread for a sandwich! 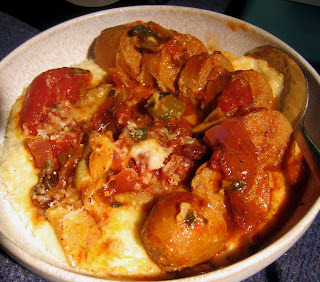 Look for more recipes for polenta coming soon to keep you fat and happy! Whisk the polenta into the liquid slowly. Stir often over medium low heat. As the polenta begins to thicken you will add another 1& 1/2 cups water, 1/2 cup at a time. Remove from stove. Add in 1/2 cup grated Parmesan cheese, 1/4 cup of goat cheese (or other creamy cheese) and fresh ground pepper. (feel free to use more cheese!) Serve. Serve over the polenta, grate fresh Parmesan cheese over the top.